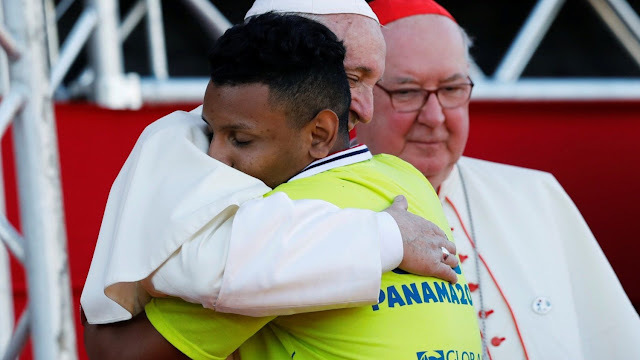 At the conclusion of World Youth Day in Panama, Pope Francis meets with 22,200-odd volunteers. The full text of the Pope's prepared remarks is below. Let us ask the Lord for his blessing. May he bless your families and communities, and all those whom you will meet and encounter in the days to come. Let us also place ourselves under the mantle of the Blessed Virgin. May Our Lady accompany you always. And, as I told you in Krakow, I do not know if I will be there for the next WYD, but Peter will surely be there to confirm you in faith. Press on, with courage and strength, and please, do not forget to pray for me. Thank you.